One of the sad things about my children growing up is that I don't get to watch early childhood TV programming anymore. I couldn't help but get totally engrossed in a few very special shows. And while my kids maintain they are past that stage of watching kiddie shows, I wanna watch them again. I wanna be a part of Little Bill's family. Comforting voices that sound like they're talking with yummy toffees in their mouths, relaxing jazz music and happy solutions to simplistic problems. I blame Little Bill's gorgeous hamster Elephant for making me capitulate to my kids' pleas for guinea pigs. 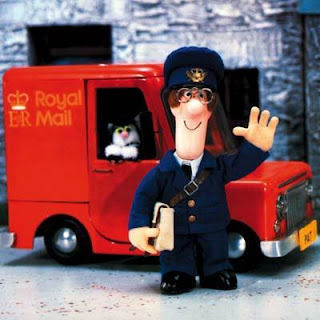 I wanna marry Postman Pat. Yup. I have a thing for the postman. Maybe it was the enchanting song that pressed home: "Pat feels he's a really happy man!" He's just so lovely -- always helping people and coming to the rescue. Or maybe it's just that I secretly wanna live in a place like Pencaster or Glendale. I wanna hang out with the cool, resourceful, adventurous Kipper. How adorable is Arnold? Who doesn't love Martin Clunes' voice? I wanna live in Hanna Montana's house, right on the beach -- and who wouldn't love her closet? The kids still watch this, but it's been awhile since I've been home when it's been on. I have to say: this is a hilariously written show and the actor who plays Jackson is brilliant.